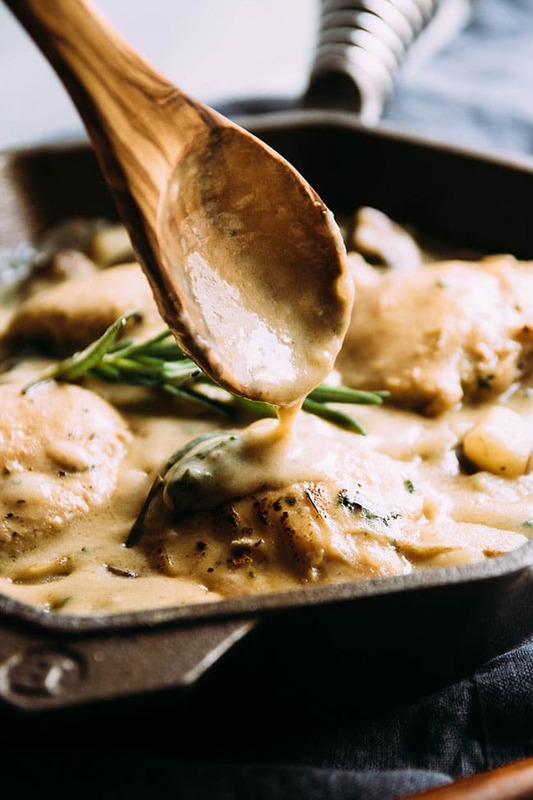 This one pan chicken recipe is perfect for busy weeknights! Ready in under an hour with a creamy garlic parmesan sauce, potatoes, mushrooms, and fresh spinach. For more easy potato recipes, check out Potatoes USA on Facebook. 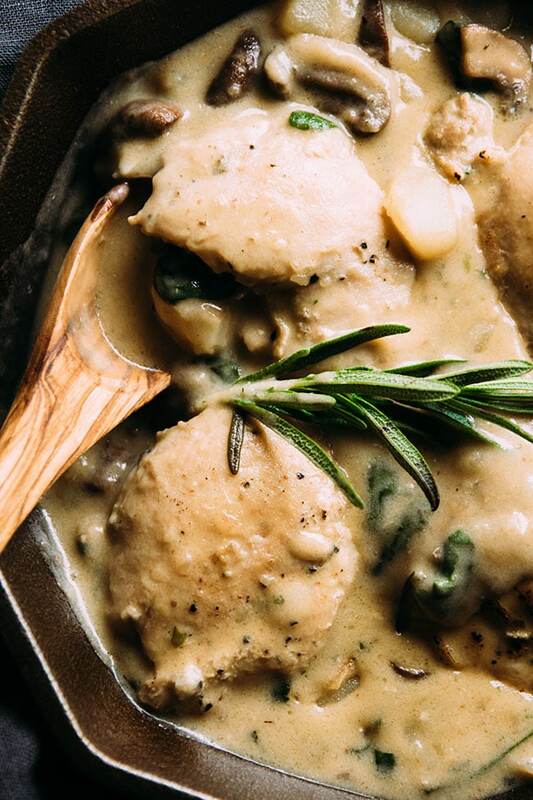 Ok. WE NEED TO TALK ABOUT THIS ONE PAN CHICKEN. ONE PAN. Did I say that already? Easy to customize – potatoes and sauce are the perfect blank canvas for any protein or veggies you have on hand! Ahhhhh, possibilities. Literally LICK-YOUR-PLATE tasty. Example: When I made this for some friends, there was an, ermmm, “conflict” over the last piece (they ended up splitting it. Because ADULTS). You could serve this over rice or quinoa if you’d like to stretch it out a bit more, but I honestly love it just as it is – it’s like a warm, cozy, ultra-comforting food hug (which is perfect, because it’s finally sweater weather and I’m craving warm cozy food baaaaaaasically 24/7). The mild, creamy, slightly starchy texture of white potatoes makes them perfect for this recipe. They also hold their shape well, so even though we’re cooking them for awhile here and then covering them in the creeeeeeeamiest sauce, you’re still going to have well-defined pieces of potato (rather than an accidentally-sort-of-mashed-but-not-in-the-good-way potatoes situation, because yikes). Also, I don’t know about you, but I almost ALWAYS have potatoes in my pantry – which means recipes like this one are ultra-convenient even when I haven’t had time to go to the store. Just use the potatoes and sauce as a base, and customize this recipe with whatever else you have on hand! (Broccoli, arugula, roasted butternut squash, and cauliflower are some of my favorite additions so far). 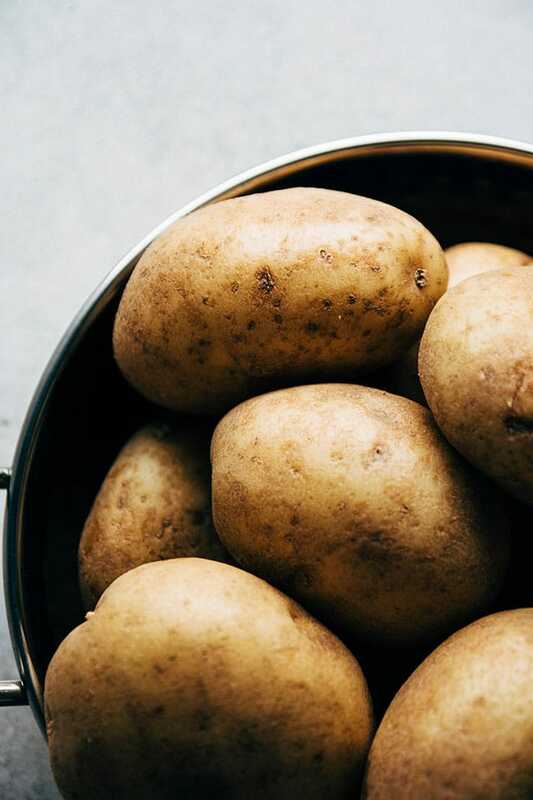 PS – if you ever want to know what type of potato might be best for a recipe, Potatoes USA has this handy-dandy guide to the most common varieties! I’m obsessed with it. 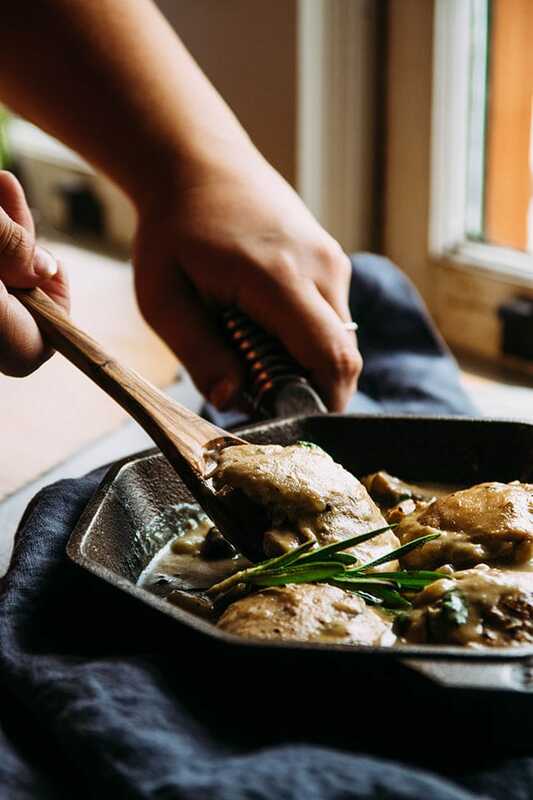 ALSO, if you’ve been following Life As A Strawberry for awhile, you’re probably picked up on the fact that I love thickening sauces with a roux, which is basically just a flour-and-butter (or olive oil) combo. 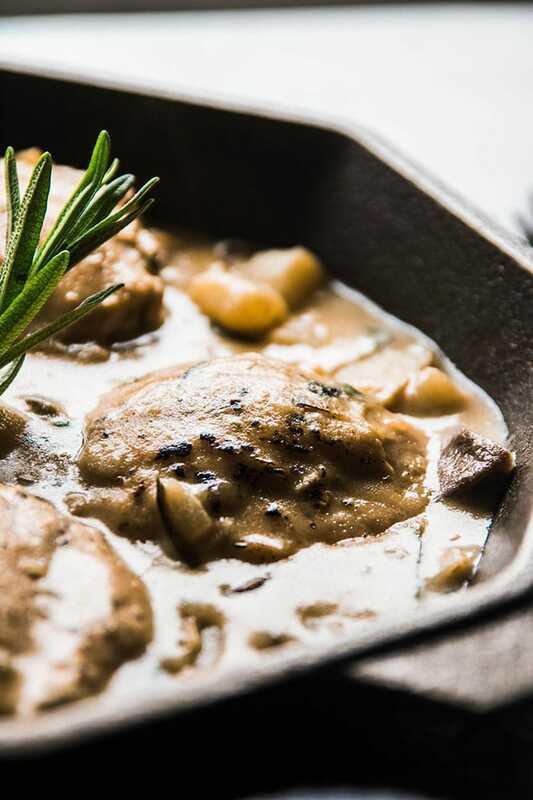 But that doesn’t always work if you’re out of flour or are following a gluten-free diet, so I mixed it up a bit for this recipe and thickened the sauce with cornstarch. 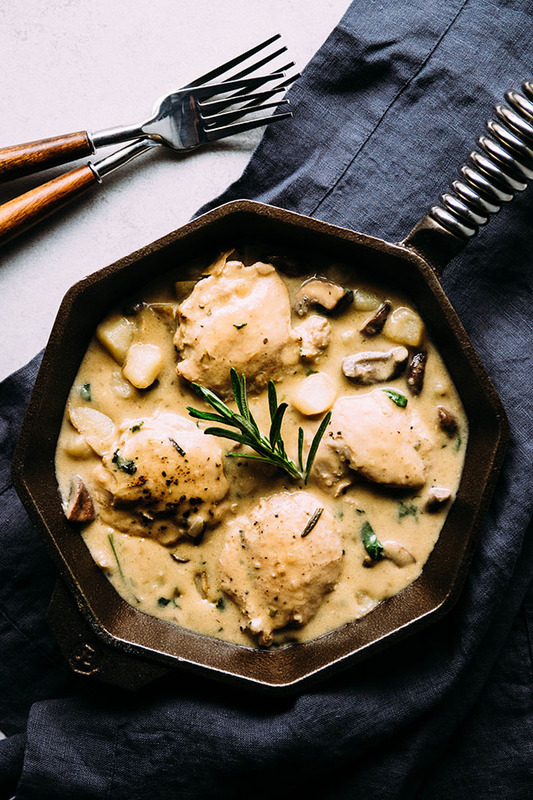 An easy one pan chicken and potatoes recipe ready in under an hour. 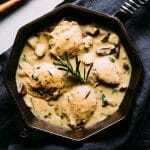 I love your recipe.Will try this soon. I adjusted the recipe to fit my family’s tastes and for what I had on hand: cauliflower instead of spinach and mushrooms, red potatoes, and leftover pre-cooked chicken, but it still turned out yummy! I will make it again. Thanks for the inspiration! Amazing. I didn’t have corn starch but it was soooooooooo perfect. My wife said it was like something you’d have at a wedding, with its fancy sauce. After dinner she stood at the stove picking at the pan for more veggie. Hi Jeff, ahhh…the after dinner stovetop pickover, you know you’ve done well! Thank you for the comment. I made this tonight and thought it was very yummy. I already had mashed potatoes so I skipped adding chopped potatoes and in the end put the chicken and veg on top of the mashed potatoes. It was good. I did pop the skillet back in the oven for a few minutes to better wilt the spinach and melt the cheese. Husbands only critique was that he was missing something crunchy so maybe next time I’ll throw some crispy onions on top. And it took longer than 45 minutes to prepare; more like an hour. I made this dish for the 1st time a few weeks ago & making it again tonight. It’s delicious! Hi Mary! Thank you and we love hearing you LOVE it! I made this today,big hit with my family. I also double the recipes but let out the spinach added abit of paprika, curry and chicken shawarma spices and abit of salt. Thank you for a wonderful recipes. Hi Theresa – woohoo, we impressed the family! Thank you for the comment. I cooked the greens separately. I used twice as much chicken stock as called for, and adjusted other ingredients accordingly to my taste. Making this again and again in variatiins! Thanks for the feedback and alternative suggestions for the recipe. So happy to hear you enjoyed the recipe! Thanks! I just finished preparing this meal and I gotta say I’m so excited to serve it to my family because it’s so delicious!! I will definitely make this again soon, granted I did not have any mushrooms on hand but it still turned out so good! Thank you for sharing this recipe! P.s. I didn’t have to add the cornstarch slurry because the sauce was already thickened by the potatoes. I’m so happy you liked it, Helene! Thank you so much for letting me know how it turned out!